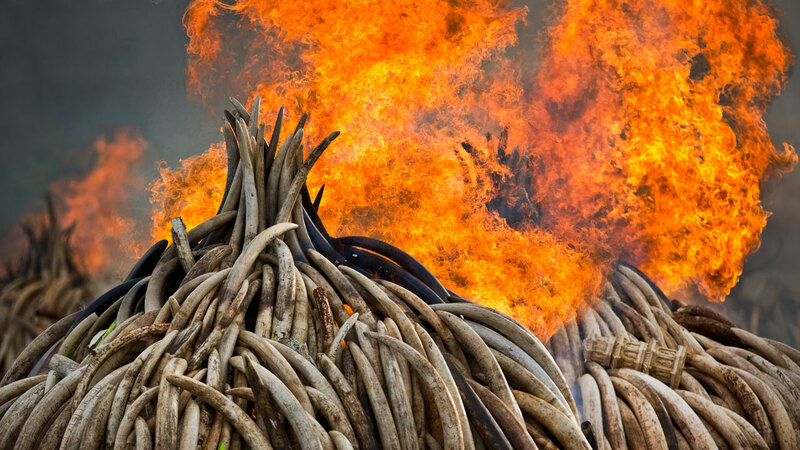 NAIROBI, KENYA (KTRK) -- The Kenyan government took a dramatic stand against wildlife poaching, destroying more than 115 tons of illegal ivory in a massive controlled burn on Saturday. Both elephant and rhinoceros tusks comprised the stockpile of illegal ivory, which the Kenya Wildlife Service said was the largest ever to be destroyed at once. "Although the destruction of elephant ivory will not in itself put an end to the illegal ivory trade in elephant ivory, it ensures that no one will ever profit from this contraband," the Kenya Wildlife Service said in a statement. "Kenya does not, and will not, tolerate this illegal trade." Although a 1989 agreement effectively outlawed the international commercial ivory trade, a black market for the highly valued material continues to thrive. Conservationists believe that as many as 35,000 African elephants are poached for their ivory tusks each year. Similarly, the black rhinoceros population across Africa has been almost completely decimated over the past 50 years.